What would Ojizo-san (Jizo statues) do? Why do they wear a red bib and/or a red cap? I explain questions of Japanese culture easily. You see Jizo statues called “Ojizo-san” all over Japan. Although you can see them at various places including along streets or near waterfalls, why do they stand there? Let’s look into the derivation and meaning of Jizo this time. What would Jizo statues do? Jizo statues are usually made of stone. People call them “Ojizo-san” or “Ojizo-sama” in a friendly manner. They are formally known as Jizo Bosatsu (Ksitigarbha), one of Bosatsu (Boddisattava) statues and an object of worship in Buddhism. In Buddhism, Bosatsu(Boddisattava) are trainers who aspire to enlightenment. Even they are trainers, they became an object of worship among ordinary people, because they lead them to Buddha’s teachings. In Sanskrit, Jizo statues is named as Ksitigarbha. It means “Earth Womb”: “Kushiti” and “Garhba” express earth and womb respectively. Jizo is named after the belief that it saves suffering people with full of affection and great mercy, as if the earth had power to foster all lives. Bosatsu is ranked next to Nyorai (Tahagata). After the dismiss of Shaka Nyorai, presently called Hotokesama (Buddha), it is believed that 5,670 million years will take for the next Buddha, Miroku Bosatsu to attain enlightenment, become a Nyorai and save people. During this time, there will be no Nyorai in the world. Juzo is believed to have been entrusted with the task of saving people from suffering during the period between the death of Shaka and the advent of Miroku. Jizo Bosatsu can disguise various objects depending on circumstances and is considered to play active roles. Jizo statues have a gentle facial expression. They are very compassionate and indispensable to us. They are also known as Koyasu Jizo, who assist women in labor, Migawari Jizo, who sacrifice themselves for suffering people caused by a mishap, and Douso Jin, who protect the boarders and streets between villages or hamlets. Considering the above features, people began to pray them for a variety of things including longevity, parenting, good harvest, and victory. Why do they wear a red bib and/or a red cap? You often see Jizo statues dressed with a red bib around their necks and/or a red cap putting over their round heads. This is because people believe Jizo to be a protector of children, so they offer Jizo a red bib and/or a red cap to wish for healthy growth of their children. Why are the bib and the cap red? People believe that red represents pure, correct, and honest. There is a traditional custom to have babies or Jizo wear red to ward off evil spirits. People also wear red to celebrate their 60th birthday called Kanreki. According to the Eto (*), the number 60 represents completion of one life circle and start of a new life as a baby. This is related to the reason why Jizo and babies wear red. Eto is also known for Jikkan Junishi (十干十二支). The name jikkan(十干) means “ten celestial stems” (甲・乙・丙・丁・戊・己・庚・辛・壬・癸) and jūnishi(十二支)means ” twelve earthly signs “(子・丑・寅・卯・辰・巳・午・未・申・酉・戌・亥). 60 patterns are formed by combining jikkan with junishi and these patterns represented day, month, year and direction. Junishi itself represented time. Jizo statues that you often encounter on the streets. By looking into the derivation, you understand that Jizo statues are very kind and precious to us. They have watched over us closely and have protected us since ancient times. 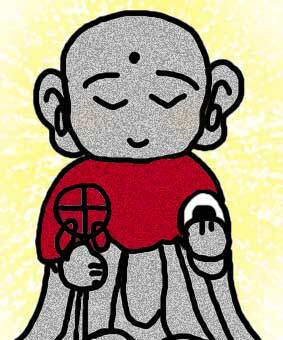 I want to express my gratitude for peaceful days and to show respect to Jizo on a usual day. What is the origin of Japanese rising sun flag? When did it become a national flag of Japan? What is the difference between Ise Jingu and Izumo Taisha? What is “Sengu”? What is komainu (lion-dog)? What is the word origin “A n (un) no kokyuu (Well-synchronized motion or behavior like breathing together)”? How many torii gates are there in Fushimi Inari Taisha shrine, and what are the history and meaning of torii? How much is one torii? When did origami (paper folding) start? How has origami been developed? What do 1,000 folded cranes named “Senbazuru” represent? What Does Sanzu as in Sanzu River Mean? Why Do We Need Rokumonsen? What is Ishizumi (Stone Piling)? What is the meaning and origin of shishi-mai? Why does the shishi-mai bite your head? History and Origin of “Kotatsu” When Do We Get “Kotatsu” Out? What is the history and meaning of Kokeshi? Is it true that Kokeshi was derived from ko (child) and keshi (erase)? Copyright© Japan Culture Lab , All Rights Reserved.